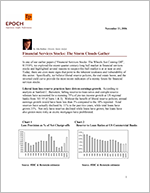 Financial Services Stocks: The Storm Clouds Gather - Epoch Investment Partners, Inc. In one of our earlier papers (“Financial Services Stocks: The Wheels Are Coming Off”, 8/15/05), we explored the recent quarter century-long bull market in financial services stocks and highlighted several reasons to suspect this bull market is at or near an end. Today, there are even more signs that point to the inherent weakness and vulnerability of this sector. Specifically, we believe liberal reserve policies, the real estate boom, and the inverted yield curve provide the most recent indicators of a stormy future for financial services stocks. Liberal loan loss reserve practices have driven earnings growth. According to analysts at Sanford C. Bernstein, falling reserve-to-loan ratios and outright reserve releases have accounted for a stunning 75% of pre-tax income growth at US regional banks from ’02-’05 (Charts 1 & 2). Without the benefit of liberal reserve policies, annual earnings growth would have been less than 3% compared to the 10% reported. Total reserves have actually declined by 11% in the past two years, while total loans have grown 21%. Not only have reserves declined while loans have grown, but loans have also grown more risky as exotic mortgages have proliferated. Current reserve practices are an example of The Law of Unintended Consequences. In fairness, managements are not being intentionally deceptive or aggressive with their reserves. They are following new GAAP guidelines that were ironically implemented after the accounting scandals following the tech and telecom bubble in the late ‘90s. According to these new guidelines, reserves must be based on actual recent credit experience (which has been very good) and not on longer term over-the-cycle credit history, which would allow for cyclical downturns. Recent credit experience has been heavily influenced by the extraordinary appreciation in residential real estate. Real housing prices have spiked sharply to record levels in the past five years (Chart 3). Similarly, the ratio of existing house prices to median family income has also grown to a record 3.8x. In addition, residential investment has surged to a record of more than 6% of nominal GDP, compared to a historical average of around 4.5% and a recession-era level of 3.5% in 1990. As a result of today’s rapidly rising real estate values, borrowers have been able to withdraw home equity to pay-off credit card debt, increase consumption and re-finance any impending mortgage resets with ease. The proliferation of exotic mortgages combined with lax lending standards has fueled real estate appreciation. Nontraditional mortgages (ARMs, pay option ARMs, interest only loans) have grown from 2% of all mortgage originations in ’00 to more than 30% of all originations by ’05 according to the Comptroller of the Currency (Chart 4). In many high priced real estate markets, nontraditional mortgages account for 50% of all originations. Roughly two-thirds of nontraditional loans are low documentation or no documentation (low doc or no doc) loans in which the borrower does not document either his income and/or his assets. The Mortgage Asset Research Institute has found that incomes are exaggerated by 50%-60% on these stated income loans, which are also known as “liar’s loans”. Nontraditional loans are very profitable (at least initially) for lenders as they come with higher fees and rates and often contain a re-set feature, which guarantees another loan. Almost 40% of all mortgages originated in 2005 had an equity cushion of 5% or less and 10% of all home owners with mortgages have no equity in their homes. Banks have significant real estate exposure. In the second quarter, bank holdings of mortgage loans excluding mortgage backed securities (MBS) reached a record 32.1% of assets (Chart 5). According to the Comptroller of the Currency, commercial banks originated nearly 60% of the $1.5 trillion in mortgage originations in the first half of this year and mortgage lending has become a key contributor to commercial bank asset growth and an increasingly important factor in their revenue and profitability. Banks have also been increasing their MBS holdings this year to more than $500B. Nearing the end of a period of unprecedented real estate price appreciation, the US banking system is more exposed to real estate today than at any time in the past 50 years. The turn in the credit cycle could be especially tough as the residential real estate market has cooled considerably and consumers are highly indebted and facing mortgage resets. Historically low reserve-to-loan ratios are unlikely to go much lower even if the current benign credit environment continued. However, there are signs the credit cycle could be turning for the worse. Preliminary estimates show the economy slowed to a 1.6% growth rate in the third quarter caused by a 17% drop in residential investment. Inventories of homes for sale have soared, while both new and existing home sales have fallen sharply, (Charts 6&7). Many home builders have reported plunging orders amid a surge in cancellations and have begun to write down landholdings and options. The National Association of Realtors reported that median home price declined 2.2% year over year in both August and September, the largest decline in 38 years (Chart 8). US mortgage interest payments were up 18% year over year in the second quarter and mortgage interest payments reached a record 10.2% of wages and salaries (Chart 9). Housing affordability has fallen to its lowest levels since 1990 (Chart 10). First payment defaults have surged for a number of sub-prime collateralized mortgage bonds. The Mortgage Bankers Association estimates that between $1.0-$1.5 trillion in mortgages will reset in the next year. While that number is large, it is not unusually large. However, it will be the first time in the recent past that resets are taking place in a flat to declining market compared to a rapidly appreciating market. Although coming too late to prevent the worst excesses of the boom, the new regulatory crackdown on nontraditional mortgages could worsen the slump. On September 29th, the federal government released its interagency guidelines on nontraditional mortgages, more than a year after it initially proposed them and over strong industry objections. The three key provisions are underwriting standards, portfolio management and consumer disclosure. Banks will now be required to evaluate the borrower’s ability to repay the debt at final maturity, assuming a fully amortizing repayment schedule. They will be required to hold higher (not lower) reserves against nontraditional loans and they will be required to fully inform the borrower of the risks these loans entail. The effect of these regulations will be reduced availability of credit which will further curtail demand for housing just as over-leveraged borrowers are facing resets on their mortgages. The inverted yield curve and fierce deposit competition are eroding margins. The low absolute level of rates and the current inverted yield curve are squeezing net interest margins as banks struggle to earn more on their assets than they pay on their liabilities. Banks describe deposit competition as fierce and those that don’t pay competitive rates have seen deposit growth slow dramatically. Current consensus opinion holds that if the Federal Reserve begins to lower short term interest rates, banks will benefit. However, Fed rate cuts will likely coincide with significant economic weakness and a corresponding decrease in credit quality, so it’s not clear that banks will benefit to the degree that investors expect.